In terms of colours, the orange inks seem to exhibit the most variation, followed by the blue inks. However, as I said above, all but two of the denominations exhibit at least 2 variations in shade, with the 4c Mackenzie King and the $2 Quebec being the only stamps for which I was not able to find any significant variation in the stamps that I studied. The $1 Vancouver showed a surprising amount of variation on the last printings, as did the 3c Robert Borden stamp. Some of the shade varieties were specific to the printer, as was the case with the CBN and BABN printings of the 1c, 2c, 6c, 7c and 8c, while others were associated only with certain type differences. The 10c and 25c both included some shade combinations that are only found on type 1, type 2, or the later perf. 13.3 type 2 stamps. As I mention in my detailed post, I believe that the varieties that I illustrate represent probably about 75-80% of all the shade vareties that exist. However, I do believe that the very high number of stamps printed and used likely means that additional shade varieties do exist and can be found, with patience and careful study of used stamps, which had not received much attention from philatelists at all. 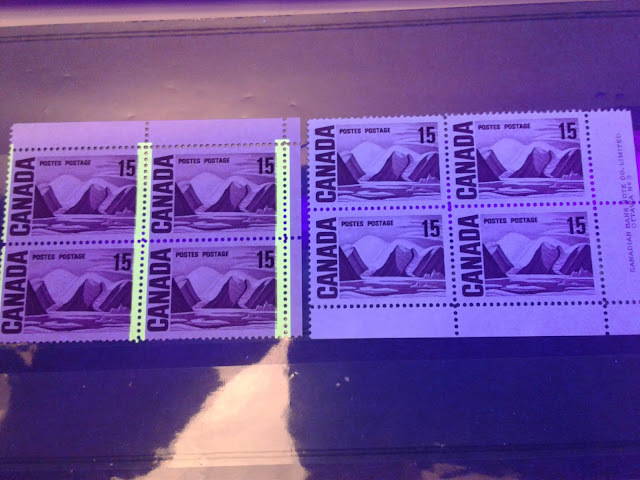 Here, if you look carefully, you can see that the left stamp and second stamp from the right are both lighter colours than the other two stamps. Then, if you compare them, you should be able to see that the third stamp from the left contains more purple and less brown. Finally, if you compare the second stamp and right stamp, you can see that the right stamp is a much colder shade than the other stamps, and contains more brown and less purple. In this example, we have three different type 2 stamps. The first two of these are perf. 12.5 x 12 and show an orange colour which is more yellowish and less red, compared to the perf. 13.3 stamp on the right. The perf. 13.3's always show this deeper more reddish orange, which I believe is significant. Even with the two perf. 12.5 x 12 stamps, there is some very slight variation, with the orange of middle stamp, being ever so slightly lighter than the stamp on the left. Most all of the other values exhibit similar differences, which I think will very likely be important for identifying certain, specific printings, some of which will be undoubtedly scarce. This concludes my post for this week. Next week, I will be looking at the perforations - not just the basic measurements, but the configuration of the perforations on the selvage of the sheets and some of the problems that CBN experienced when printing the low value stamps, which were the first stamps that they comb perforated.